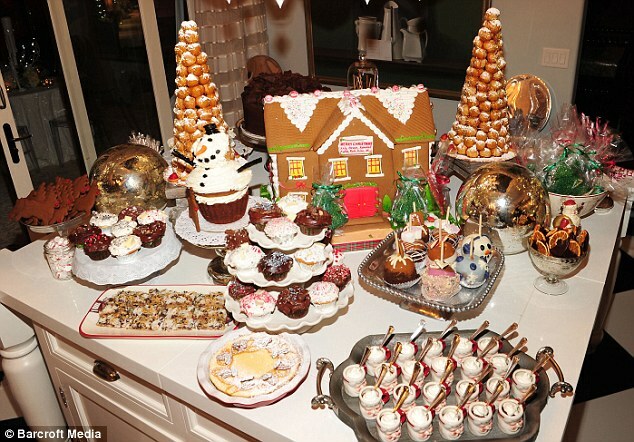 It was of course a lavish affair and now fans can get a glimpse of just how glamorous the Kardashian's annual Christmas Eve party really was. Photographs show the famous family posing with Santa Claus, opening presents by the Christmas tree and making the most of the festive period and quality time together. Kim, 31, looked far from miserable about her recent heartache as she glammed up for the occasion in a floor-length dress and no doubt asked the big man himself if he could just grant her a speedy divorce from Kris Humphries. 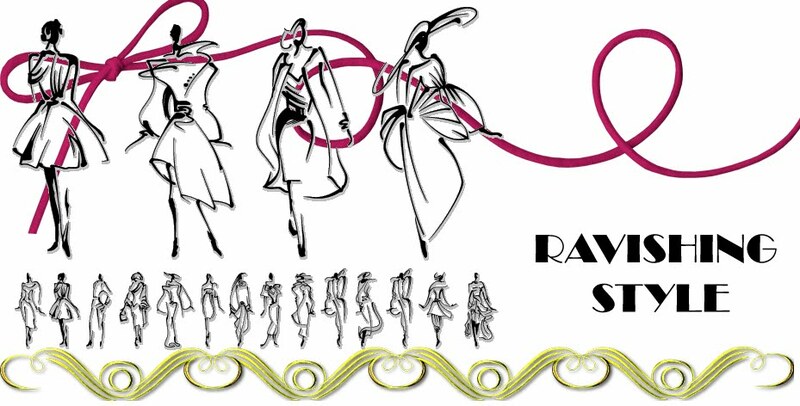 The silver grey garment was long-sleeved and Kim teamed it with a pair of matching stilettos and several bangles. 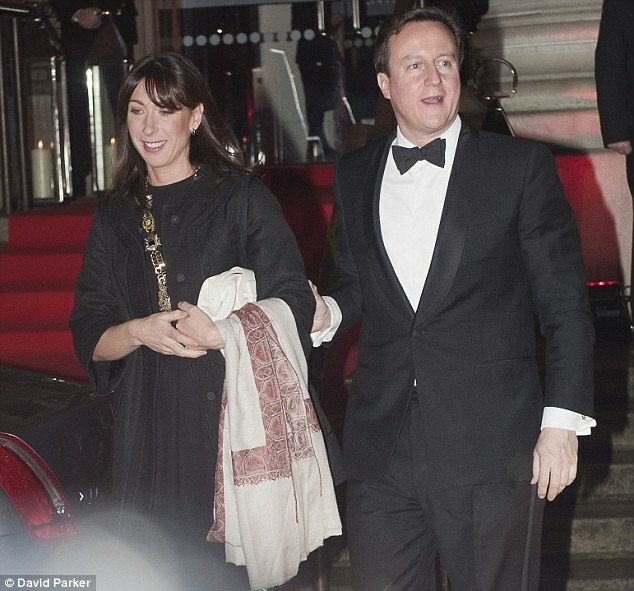 However, it wasn't long until she's had enough of being dressed up and emerged wearing a pair of gnome-print pyjamas. The brunette giggled and played with the young kids as she donned a pair of reindeer antlers too. She spent time cuddling her adorable nephew Mason as they admired her younger sisters new chocolate Labrador puppies. 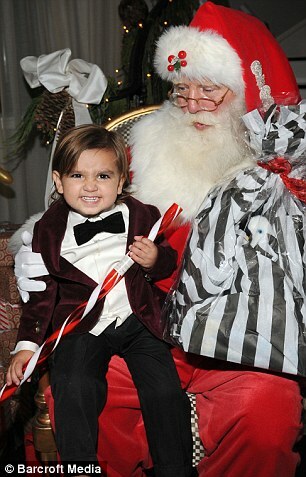 The two-year-old had also been dressed up for the party and wore a dark red velvet blazer with a white shirt and black bow tie. 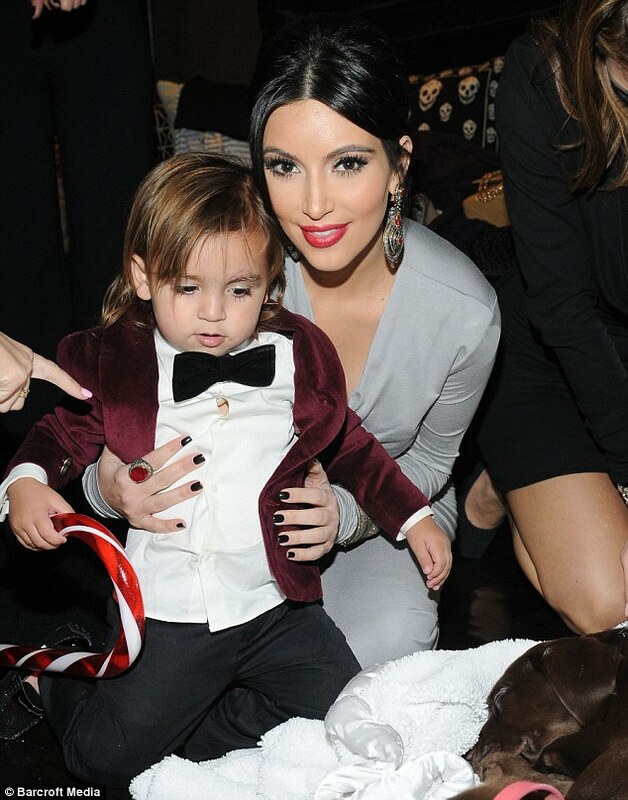 His mother Kourtney looked happy and relaxed as she posed with her son who wore a hat made of balloons. She showed off her growing baby bump on a black shift dress that had lace sleeves, which seemed to match her boyfriend's attire. 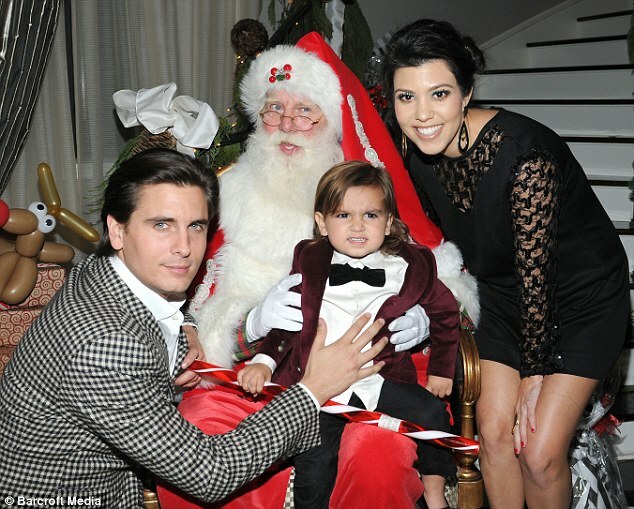 Scott Disick wore a black and white checked suit with a white shirt and looked rather serious as he posed with the rest of the family. Lady of the house and mother to the children, Kris Jenner, looked exceptionally glamorous in a black floor-length dress that was covered in sequins. She also stopped by the staircase for a chat with Santa and looked rather happy with one of her gifts - an Apple iHome docking station. Kris also spent time mingling with her party guests which included plastic surgeon Garth Fisher and former ox Sugar Ray Leonard. His teenage daughters Kendall and Kylie looked older than their years in more glamorous party dresses. Kendall wore a rather short black fitted dress that was decorated with tiny gold studs whereas Kylie opted for a short cream dress that had a pleated skirt. 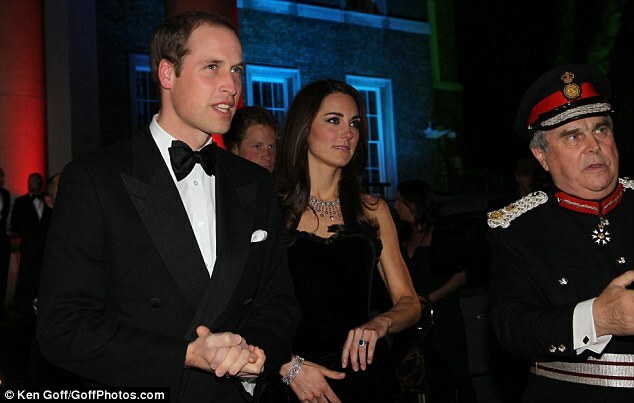 It was recently revealed that the pair have named the dogs Louis and Vuitton. Someone who didn't look so pleased to see Father Christmas was Mason. The toddler looked annoyed as his father Scott held him up on the bearded man's lap and appeared desperate to get back down. His parents couldn't miss an opportunity for a photograph though and posed for the cameras as their son pulled a face. They were later seen posing again by the Christmas tree as Mason clutched his giant candy cane and looked tired in his mother's arms. Kim's brother wasn't so keen on being in front of the cameras either and only posed for a few pictures with his family. The former Dancing With The Stars contestant wore a simple black shirt and matching trousers with red suede shoes. But he wasn't the only Kardashian sibling who wasn't pictured much as someone who wasn't even there at all was Khloe. The 27-year-old was in Dallas with her husband Lamar Odom for the opening of the NBA season as he is now playing for the Dallas Mavericks. But the famous family made up for Khloe's absence as they were joined by various celebrity friends. 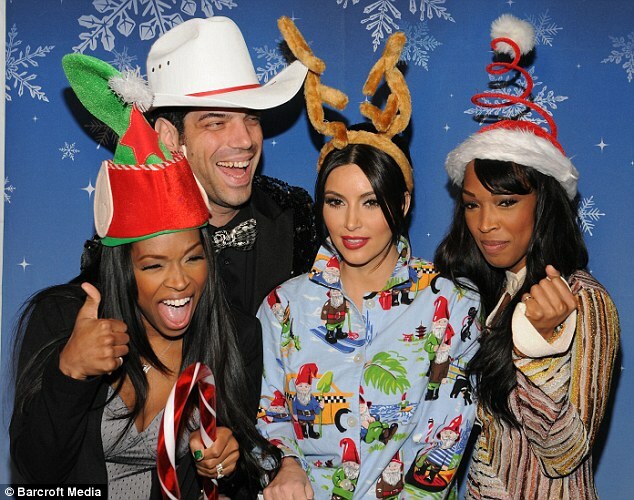 The women - who have starred in the Kardashian reality programmes - donned Christmas hats as they posed with Kim and celebrity make-up artist Rob Scheppy. It's no surprise that the guests were so happy and excited because judging by the amount of treats that were available, their sugar intake was probably sky-high.